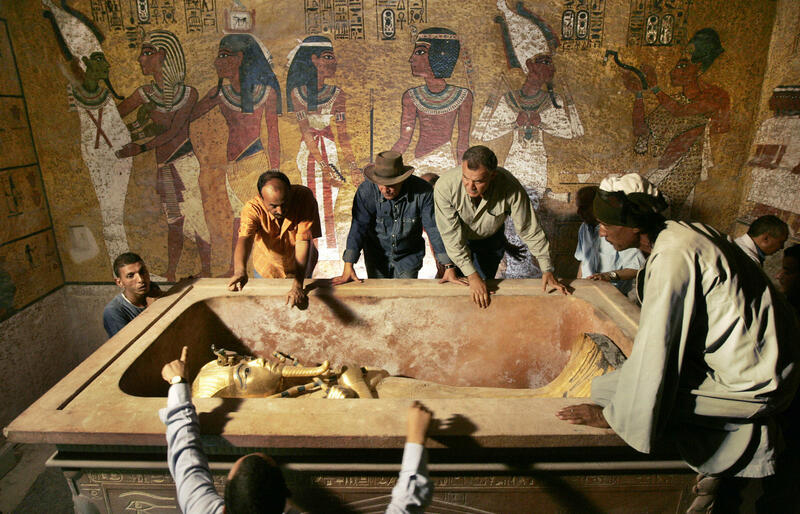 CAIRO -- Archaeologists are starting radar scans of the tomb of famed pharaoh Tutankhamun in the southern city of Luxor, Egypt's Antiquities Ministry said Thursday. The scans will be carried out over a week to check for the existence of any hidden chambers behind the tomb, according to the ministry. Egypt carried out previous scans as part of the quest, but the findings were inconclusive. The tomb of King Tut, who ruled Egypt more than 3,000 years ago, was discovered in 1922 in the Valley of the Kings, located on the west bank of the Nile river in Luxor. For many, Tut embodies ancient Egypt's glory because his tomb was packed with the glittering wealth of the rich 18th Dynasty from 1569 to 1315 B.C. Scanning techniques have been used for other purposes. The BBC reported late last year that techniques developed in London reveal what is written on the papyrus that mummy cases were made from. Ancient Egyptians used the scraps of papyrus for shopping lists or tax returns. "Because the waste papyrus was used to make prestige objects, they have been preserved for 2,000 years," said Adam Gibson of University College London, the BBC reported. "And so these masks constitute one of the best libraries we have of waste papyrus that would otherwise have been thrown away so it includes information about these individual people about their everyday lives."